Love can come in all forms, and for Charles Farriér, owner of Crumble & Whisk, love means cheesecake. 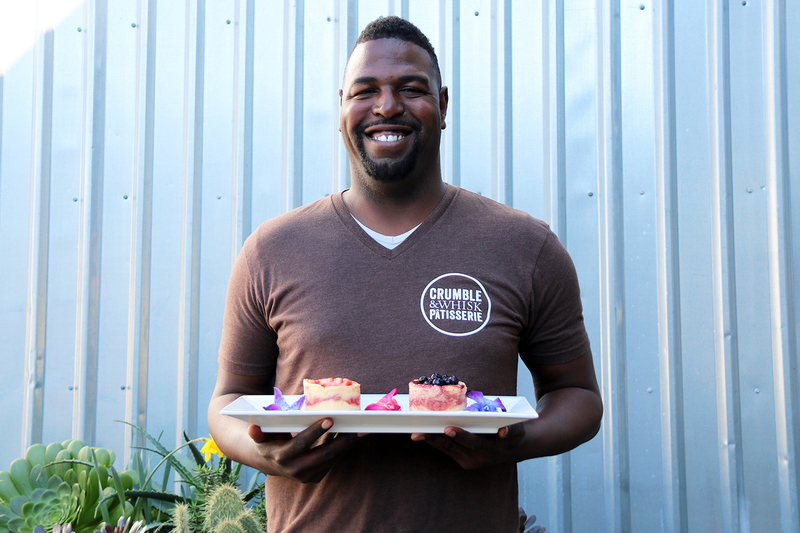 The Oakland native started his specialty cake business in 2013 with a passion for uplifting his community and providing high-quality cheesecakes using fresh, local ingredients. Charles perfected his classical French pastry techniques over the course of many years studying under esteemed black chefs and working as a chef in nontraditional settings such as trains and cruise ships. In 2013, he was selected as one of a few male entrepreneurs to participate in La Cocina’s prestigious incubator program, and since then has developed a devoted and growing following through Bay Area farmers markets. 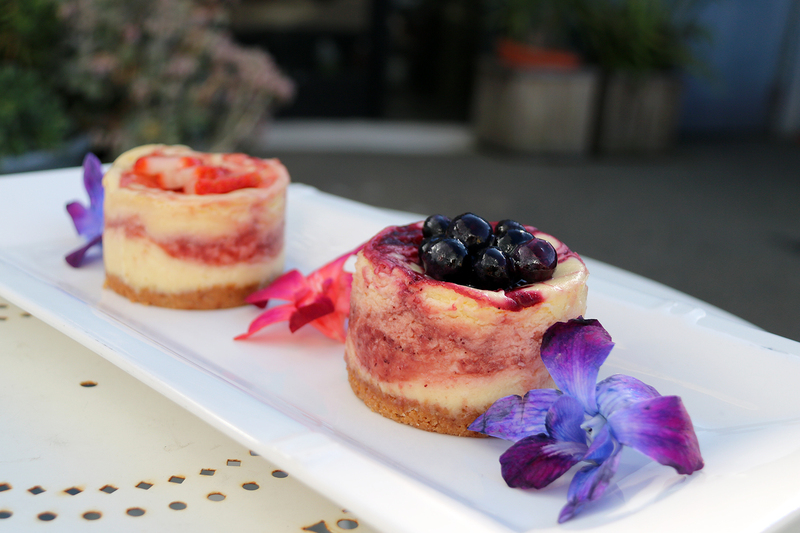 In addition to his regular Ferry Plaza stand on Saturdays, he’ll start selling his made-with-love cheesecakes at the Jack London Square Farmers Market this Sunday. 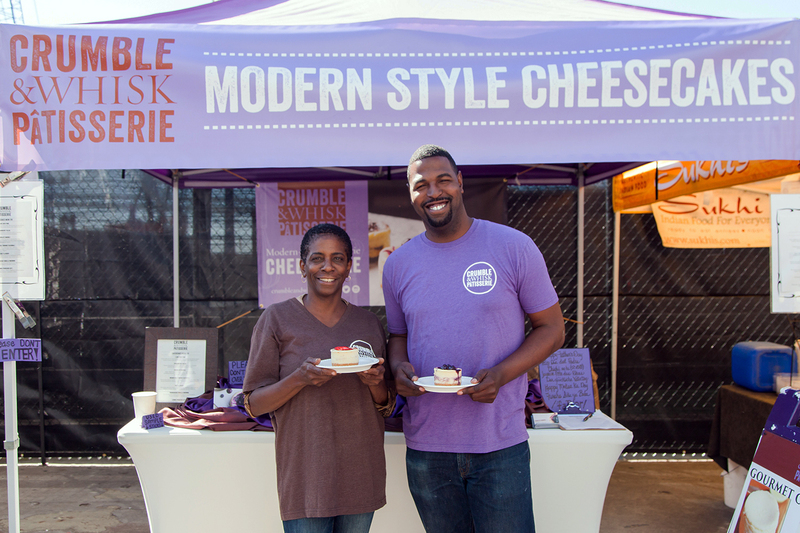 We talked with Charles about how he got his start in the niche world of gourmet cheesecakes and what treats he has in store for Valentine’s Day. How did you start making cheesecakes? It’s actually a funny story. I was at work one day when we had a potluck, and everyone said I should bring in a dessert. So I brought in a cheesecake. I had never made a cheesecake in my life. Everyone thought it was fabulous, all because I had a pastry background and I knew how to bake, and that they wanted to buy cheesecakes from me. So after that, one of my good friends suggested I try to do it as a business. What inspired you to start Crumble & Whisk? I said if I’m going to do this, I really want to do this for all the young African-American kids, specifically boys who had a disadvantage of growing up being talked down to and being discouraged. I really wanted to give them a face to look up to, that they can look to and have a self-reflection. A lot of us idolize celebrities, sports players, and models, and that’s great, but those people are unrelatable. You need someone within your community who you can actually come to and reach out to. What advice would you give an entrepreneur who wants to start their own food business? Don’t quit your day job! Do a lot of research. Ask a lot of questions. Do an internship to see if that is actually something you really want to do and feel that you can do on your own. Because having a passion for it is one thing, but also having the motivation and being able to move forward is another. You have to have the drive, the passion, the community, and the people. If you don’t have that, then you don’t have a business. Tell us a bit about your process in making your cheesecakes. It takes about two days to put it all together, from start to finish. How I start the process is by thinking what can I do that is really mind-blowing in terms of flavor profiles. There is a book that I always source, called The Flavor Bible. We are the only company I know that does a two-step process by putting the flavor profile in the cake, and not just as a topping. What a lot of people do is only put the flavor on top, and once you get past the first layer it tastes like you are just eating cheese at that point. How do you shop for the ingredients that go into your cheesecakes? I go with what is in season and what is available at the farmers market, thinking about which holidays are coming up. I like being out there with the community and meeting the other vendors to build relationships with them. What goes into determining the flavors of your cheesecakes? I really wanted to focus on flavor diversity. I wanted to do more of an updated modern twist and not your typical candy, cookie-coated flavors. What are your most unusual flavors? During springtime we do an avocado and green tea cheesecake, and a lot of people love it. And in the summer we do roasted corn and blackberry. We use fresh-shucked corn that we shuck here in the kitchen and roast it all. And make a blackberry jam to add to it. What specials do you have for all the Valentine’s Day? The four flavors that we are going to have in our Valentine’s Day box are Classic New York, Organic Strawberry, Beet & Berry, and Chocolate Lover’s Lane. Find Crumble & Whisk at Jack London Square Farmers Market starting this Sunday, and at the Ferry Plaza Farmers Market on Saturdays. Top photo of Charles and Carol at the farmers market by Amanda Lynn Photography. Bottom two photos by Daisy Prado.